1.1.a, 1.1.b, 1.1.c, 1.1.1.a, 1.1.1.b, 1.1.2.b, 1.1.4.a, 1.1.5.a, 1.1.5.b, 1.1.5.c, 1.2.c, 2.2.2(storyboard for audio/video technologies): Each phase of the ADDIE Design model was completed for the analysis, design, development, implementation, and evaluation of this project. We analyzed the needs and tasks, identified learners and their characteristics, explicitly considered those with special needs, used a storyboard process for the design, carefully selected appropriate components to develop the lesson, implemented the lesson with parents and classmates, evaluated the learners with formative and summative assessments, and let learners be a part of evaluating the lesson, finally, we modified the lesson based on those evaluations. This page and BookBuilder book was created as group project in EDET 722 in the fall of 2012. BookBuilder allows you to create accessible digital books and our group chose to create a book to help parents learn the characteristics of cyber-bullying and teach a lesson on how to prevent cyberbullying. The project required an explicit ADDIE design process that involved each group member in the process. Each phase of the ADDIE process and each group member’s contributions are documented in one of my management artifacts BreakingDesigns. Our group had an extended period of time to complete the project and the BookBuilder tool was recommended/required. My title in the group was Content Expert, I focused on the design of the content for the identified users: Title I Parents. The team contained a total of four members who each focused on their strengths. 1.2.a, 1.2.b, 1.2.c, 1.3.a, 1.3.c, 1.3.d, 1.4.a, 1.4.b, 1.4.c: I determined that the majority of the audience would not have difficulty viewing or hearing the presentation but would likely be reluctant to read a narrative, so I chose to use a video format that combined text, images, and video. I segmented the content and interspersed with videos of students and staff that added interest and increased motivation to complete the entire video. I provided the video in multiple formats/locations (websites, DVD, TV) to meet the needs of the learners/audience. 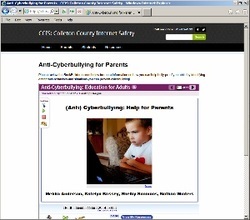 The video artifact is available for parents of Colleton County School District Students at the Title I Website ccsdtitle1.org and was provided to members of the AdvancED accreditation ERT team on flash drives. I designed and developed the video at the request of district administrators who wanted to share the results of the district’s self-assessment and summarize information submitted to AdvancED. The objective for this video is purely informational and no evaluation to assess retention was required. The video is also available on YouTube, or on DVD in our office, and will be broadcast on local TV channel 56. Time was a limiting factor for this project, the project was completed in less than one month from March 15 to April 12, 2013, excluding one week of Spring Break that I spent ill in bed. All of the video was recorded on a Flip camera or a cell phone by district staff, the narration was recorded and edited with Audacity, a free audio editor. I purchased and learned to used the AVS Video editor as Windows Live Movie Maker was not sufficiently sophisticated. This type of project is new in the district and so I based everything on the ADDIE model for planning the scenes with an outline and creating the PowerPoint as a storyboard, to using outlines to develop the script and applying UDL and principles of accessibility to the design. Another concern was the variability in the backgrounds of the intended audiences, Title I parents are economically disadvantaged and are not likely to have a college education, while the ERT team is made up of educators with advanced degrees and years of educational experience. The characteristics of the audience led me to use simple language, reference supporting documents, and define some terms that the district administration deemed important. This is a completed project for the purposes of the district, it was presented to parents and the ERT team on Monday, April 15, 2013. I plan to correct the captions on YouTube to improve the accessibility of the video over the summer. Based on the success of the video, it is likely there will be several more in the future and the process of planning will serve me well as a basis for future productions. I was the designer and sole editor for this production. Although I received video and content from district administrators, I designed the storyboard and PowerPoint, edited scripts, audio, and video, and recorded much of the narration. 1.1.a, 1.1.1.a, 1.1.2.b; 1.1.3.a, 1.1.3.b, 1.1.5.a, 1.1.5.c, 1.2.a, 1.3.a, 1.3.d, 1.4.b, 1.4.c: Based on an assessment of the learner characteristics conducted in the course of implementing the ADDIE design model, I developed a lesson and visual design structure to maximize the effectiveness of instruction without excessive cognitive load. Strategies included simple direct instruction, videos of examples, concise instructional materials, emphasis on relevance and recognition for completion of modules. Identified learner characteristics include: inexperienced online course takers, relatively high motivation, inexperienced with content, adult learners, children of various ages, limited time for task. As a group, we agreed on specific objectives and the instruction is designed to meet the needs of all learners and includes accommodation for learners with special needs while implementing a variety of media choices (audio, video, text). Each module includes a brief assessment designed to evaluate attainment of course objectives. 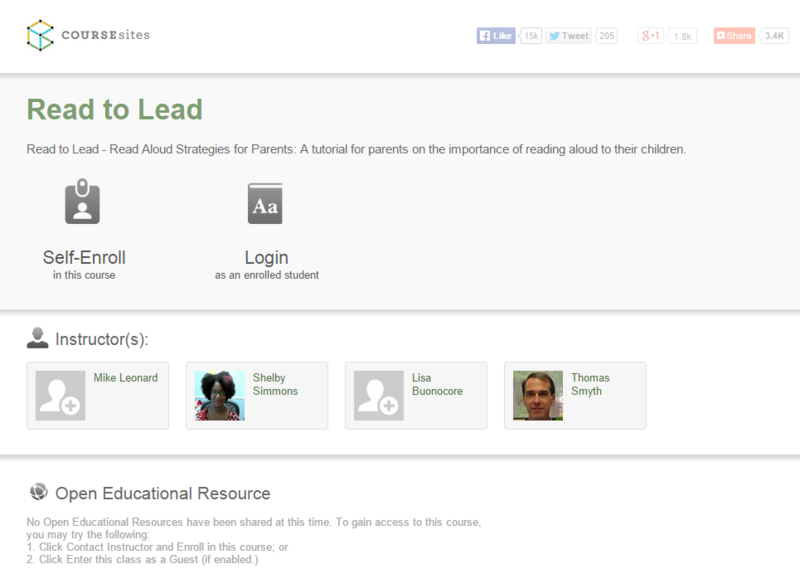 This course of reading aloud to children is designed for parents of children ages 0 to 10 and is available online through the Coursesites management tool for free. The purpose of this course is to train parents/adults to conduct age and developmentally appropriate read-aloud sessions with children and improve child/family literacy skills. This course was create as a group effort during EDET 755 in the summer of 2014. The course is designed for implementation with volunteer groups and parents in the Colleton County School district. The elements of video, module structure, and materials were selected and designed with collective input for an adult audience with limited experience in providing instruction or taking online courses. Videos were created based on a slide show modified from an existing project with new narration and supplemental information I designed as the group's content expert and narrator. The course is currently available online and another member of the group and I are collaborating to continue to develop the course and provide additional materials. The course includes an assessment for each module completed and is in an asynchronous format. I functioned as the content and design expert modifying the PowerPoint from a group member's program for the purpose of the course, adding new information, changing the color scheme, adding images, writing, editing, narrating, and differentiating content for age and developmental appropriateness for implementation as well as for intended audience. 1.1.c Identify learning theories from which each model is derived and the consequent implications. 1.1.1.a Write appropriate objectives for specific content and outcome levels. 1.1.1.b Analyze instructional tasks, content, and context. 1.2.a Apply principles of educational psychology, communications theory, and visual literacy to the selection of media for macro- and micro-level design of instruction. 1.2.b Apply principles of educational psychology, communications theory, and visual literacy to the development of instructional messages specific to the learning task. 1.2.c Understand, recognize and apply basic principles of message design in the development of a variety of communications with their learners. 1.4.a Identify a broad range of observed and hypothetical learner characteristics for their particular area(s) of preparation. 1.4.b Describe and/or document specific learner characteristics which influence the selection of instructional strategies. 1.4.c Describe and/or document specific learner characteristics which influence the implementation of instructional strategies.